This is awesome, it looks to me like Karl Marx will go far. Bracket awesomeness! Nicely done, love it. It looks like somebody has Karl Marx confused with Jerry Garcia. Classy beards, I thought Billy Gibbons would have ranked though. I like how Jesus and Kenny Rogers are the only two with that anointed glow emanating from them. This is my favorite of yours since I've started following. Fantastic! THIS IS AWESOME! I see Raffi and Karl Marx doing well here. My money's on Abe. His beard is fantastic. We're not talking size, we're talking good beards. also, where is Tim Curry in all of this? Shel Silverstein will mop the floor with Rafi. Or at least with his beard. The Goat for at least one upset. HMMMM - no Che or post Beatles John Lennon ? You forgot Chuck Norris! I would not want to be you now. You going to fill out the bracket? Will the matches be posted on national television? Very important questions. This is fantastic. I love beards so much. Good post! Hahah this reminds me of this stupid post I did about my favorite moustaches a couple of weeks ago. Only, where is Walt Whitman? I must say he is my favorite beard. Besides Shel Silversteen, his beard is totally spot on. I wish I could grow one, but I have a hormone disorder. Was going to mention Walt Whitman, but jean got it. 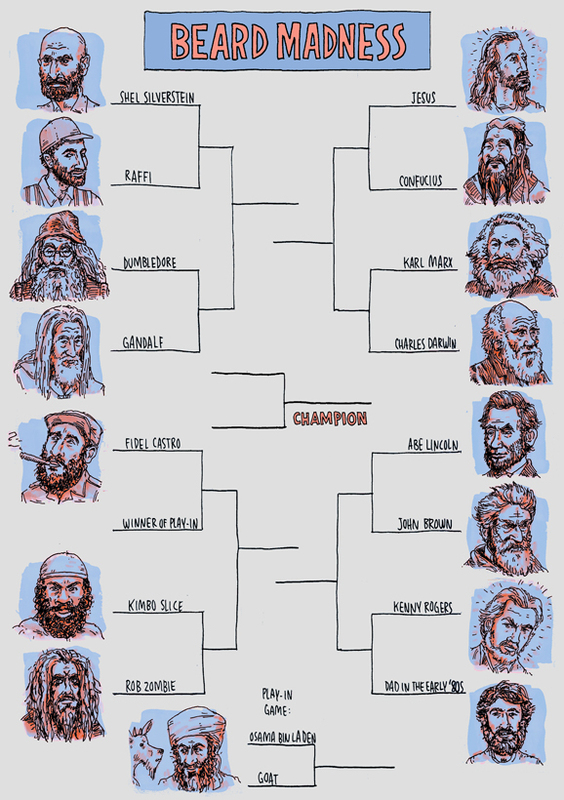 Also, I think Grizzly Adams should be in there and would easily take Lincoln! Ahahaha! Winner of play in is great! Thanks for all the comments! Just a reminder to get your brackets filled out - or make up a bracket of your own. The winner of Beard Madness will be announced within the next couple weeks, as "One Shining Moment" plays in the background. As for March Madness, Kansas Jayhawks all the way! Why should you root for Kansas? Because the Morris twins have identical beards and identical tattoos. Dumbledore vs. Jesus. Now that's a battle I would pay to see! I had Santa going all the way, but he didn't even make it to the sweet sixteen. There goes my $5. Seriously, this is awesome. Well done. Why are you in Dental School? Santa always seems to disappear after a strong showing in December. As for dental school: it brings me very close to many beards. But not in a weird way.